Eco Bag Industries answers some frequently asked questions about its automatic tree and plant watering system, the Eco drip irrigation system bag. Q. How often do the drip irrigation bags need refilling? A. The bag needs to be filled roughly every 3 - 4 weeks in summer and less in winter. The flow can be temporarily stopped in wet seasons, leaving the bag to control weeds. Q. What is the capacity of the bags? A. The Eco drip irrigation system bags hold roughly 25 litres of water and the capillary wick can be adjusted to deliver 1 litre every 24 hours. Q. How do you fill the bags? A. They can be filled Individually using a watering can, hose or tanker and pump or alternatively multiple bags can be filled at once by using a riser tube connected to the water line. Q. Can a bag establish more than one tree and how long will the bag last? A. The Eco bag is manufactured from special UV treated laminated vinyl, giving them durability and a long life. 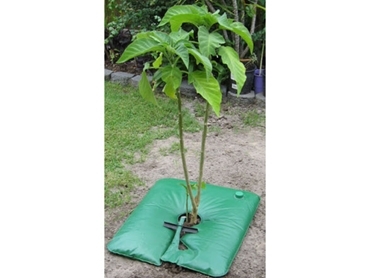 They can be used to establish a number of good size trees by moving the emptied bag to a new tree every 18 - 24 months. Q. How much ground around the tree will a bag cover for weed control? Q. Is it possible for the water in the bags to over heat? A. Even when the Eco bags get hot, the water droplets will be cooled by the time they hit the ground. Trees will also get the hydroponic benefit of warm water and insulation. Q. Does the water need to be filtered? A. No. The capillary tubes are very difficult to block up so any reasonable creek or available water can be used. Q. Can fertiliser be added to the bags? A. Yes. Soluble fertiliser can be added for a slow release boost. Q. Can the bag be hidden? A. Yes, it is advisable to cover the bag with straw or a light mulch in order to blend in with the surrounding area. Q. What is the advantage of using a drip over a sprinkler? A. Drip watering is more efficient as less water is wasted through evaporation. Drip watering systems slowly deliver water exactly where it's needed. In addition because water is delivered directly to the soil and plant roots disease from wet leaves etc. is less likely to be spread.